Francis Foulkes. Ephesians: An Introduction and Commentary (Tyndale New Testament Commentaries). Hetty Lalleman. TOTC Jeremiah and Lamentations (New Edition) (Tyndale Old Testament Commentary Series). Donald Guthrie. The Pastoral Epistles: An Introduction and Commentary (Tyndale New Testament Commentary Series). Colin G. Kruse. John: An Introduction and Survey (Tyndale New Testament Commentaries). COLE ALAN. Mark: An Introduction and Survey (Tyndale New Testament Commentaries). Wayne Grudem. 1 Peter (Tyndale New Testament Commentaries). Peter Adam. Message of Malachi. Hubbard, David Allan. Hosea (Tyndale Old Testament Commentaries). Leon Morris. Revelation: An Introduction and Commentary. Baker, David W.,Alexander, T.Desmond,Waltke, Bruce K. Obadiah, Jonah and Micah. F. F. Bruce. Romans: An Introduction and Survey (Tyndale New Testament Commentaries). I.Howard Marshall. Acts: An Introduction and Survey (Tyndale New Testament Commentaries). Eddie Askew. Making a Mark. Francis I. Andersen. Job: An Introduction and Survey (Tyndale Old Testament Commentaries). John Stott. Letters of John (Tyndale New Testament Commentaries). DONALD GUTHRIE. Hebrews: An Introduction and Commentary (Tyndale New Testament Commentary Series). We can help you find the bible commentary books you are looking for. As the world's largest independent marketplace for new, used and rare books, you always get the best in service and value when you buy from Biblio.com, and all of your purchases are backed by our return guarantee. Unlike Paul's letters to the Galatians or the Corinthians, the letter to the Ephesians contains almost no clues about the situation and issues its recipients faced. Nevertheless, the letter vividly depicts how God's will revealed in Christ reorients believers' lives toward unity, mutual respect, submission and love - in short, new life in Christ. Francis Foulkes expounds with clarity and ease the letter's central themes and emphases. This classic commentary has been completely retypeset and presented in a fresh, vibrant new large paperback format, with new global branding. Despite the return of the Hebrews from the Babylonian exile, selfishness, apathy and despair crippled their community spirit. In response to this distress, God raised up three prophetic voices in Jerusalem. Haggai rallied the people to rebuild the Second Temple. Zechariah was given visions of the return of the glory of the Lord to Zion. Malachi preached repentance, covenant justice and restoration of proper temple worship. Andrew Hill's excellent commentary on these oracles shows how they remain timely for the Christian church's worship and mission in the world. Peter's short letter to the 'exiles of the Dispersion' addresses many topics: holiness, the sufferings of Christ, suffering as a Christian, God's sovereignty in salvation and life, the grace of God, the work of the Holy Spirit, the church as the new people of God, the reality of the unseen spiritual world, and trusting in God in the midst of daily circumstances. It is suffering, Wayne Grudem suggests, that ties these seemingly disparate themes together, particularly suffering as a form of imitating Christ, who, by bearing our sins on the cross, gives meaning and comfort to Christians in all aspects of their daily lives. God's persistence in speaking to an age that persistently contradicts or questions his every word is a clear and timely picture of the sin and grace in close proximity in our own times. God's people neither serve him enthusiastically nor turn away in blatant disobedience, but this is not neutral territory; it’s a minefield of self-deception. Through this BST commentary Malachi, speaks to the modern world about the need to bring performance into line with profession. His message, therefore, is current and Peter Adam shows how Malachi is God's effective remedy for such a situation and that, at the heart of God's people, must lie a deep, overwhelming conviction that God loves them. New Haven and London: Yale University Press, 1989. Hardcover. Near fine/Very good. A modern-spelling edition of the 1534 translation with an introduction by David Daniell. Quarto. Original blue cloth binding, with gilt titles and a ribbon marker. Internally crisp and clean. The dust jacket is a touch edgeworn, with two closed tears that have been mended with tape on the verso; otherwise very good. These commentaries are designed to help the reader of the Bible understand what the text says and what it means. The Introduction to each book gives a concise but thorough treatment of its authorship, date, original setting and purpose. Following a structural Analysis, the Commentary takes the book section by section, drawing out its main themes, and also comments on individual verses and problems of interpretation. Additional Notes provide fuller discussion of particular difficulties. The goal throughout is to explain the true meaning of the Bible and make its message plain. Obadiah's oracle against Edom. Jonah's mission to the city of Nineveh. Micah's message to Samaria and Jerusalem. The texts of these minor but important prophets receive a fresh and penetrating analysis in this introduction and commentary. The authors consider each book's historical setting, composition, structure and authorship, as well as important themes and issues. Each book is then expounded in a concise and informative style. This book is in good condition. Dust Cover Missing. Only lightly used. Book has minimal wear to cover and binding. A few pages may have small creases. 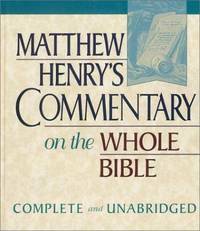 For 300 years, Matthew Henry's Commentary has been a favorite of teachers, preachers, and laypeople. His rich exposition and useful applications are perfect for devotional reading and sermon help. This edition features modern, easy-to-read print and J.B. Williams's extensive 1828 account of Henry's life and writings. From Genesis to Revelation, Matthew Henry successfully combines practical application, devotional insight, and scholarship on the entire Bible. Henry has profound insights on the content, message and nature of God's divine revelation. Perfect for all readers of the Bible who want an attractive and afforable hardcover set of this classic commentary. Traditionally, Jeremiah is thought of as a book of judgment, doom and destruction. But the message Jeremiah prophecies describe a God who will never give up on those he has called to be his people – a God of love, grace and justice. While Lamentations documents a distressing and dark age for the Israelites, it too provides rays of hope and grace through the grief of a nation. Hetty Lalleman gives us an informative and fascinating commentary on these two books, offering today’s readers a glimpse of the past and the new beginning, new covenant and new hope the prophets foretell. The Tyndale Bible Commentaries are designed to help the reader of the Bible understand what the text says and what it means. Inside these commentaries are: • A concise but thorough introduction to each book dealing with its authorship, date, original setting and purpose. • A structural analysis • Section-by-section exegesis, drawing out its main themes, and also comments on individual verses and problems of interpretation. • Additional Notes providing wider discussion of particular difficulties. Among the Gospels, John's is unique. It has a unique structure with long conversations and extended debates, and much of its content is not found elsewhere. Jesus' relationship to the Father and his teaching on the Holy Spirit are given special prominence. Ultimately, faith, believing in Jesus, is at the centre - with signs highlighted to provoke faith and stories of those who responded to Jesus as examples of faith. Colin Kruse ably shows how the Fourth Gospel weaves its themes of belief and unbelief into its rich Christology. This classic commentary has been completely retypeset and presented in a fresh, vibrant new large paperback format, with new global branding. It is, perhaps, the most unique marriage in history; one that was based upon, and thoroughly saturated with God's covenant; the purpose of God's revelation. Hosea heard God's call to marry, what Israel herself was, a prostitute. As we enter this book, which unlike other prophets who are often powerful untouchable voices, or mysterious and enigmatic figures speaking from the shadows, Hosea is simple and straightforward, and most of all about faithful love. Old testament scholar, David Allan Hubbard, takes us through this prophetic ministry of love in his commentary on Hosea and illuminates a tragic story of unfaithfulness, heartbreak, and judgment. Who is Jesus? What is salvation? What is the good news? Our earliest written account of Jesus' ministry is widely acknowledged to be that of the Gospel of Mark. If so, it remains key in our answering these questions. Alan Cole treads a careful path between exclusively this-worldly or other-worldly interpretations of this landmark Gospel. His commentary provides a helpful starting point for all contemporary preaching and teaching from this Gospel. This classic commentary has been completely retypeset and presented in a fresh, vibrant new large paperback format, with new global branding. Throughout the centuries the book of Revelation has been subjected to wildly different interpretations. Why? 'Its symbolism belongs to the first century, not to our own age,' says Leon Morris in the preface to his commentary. Here he explains the ancient metaphors and symbols - most important, a slain lamb - in ways that demonstrate their compelling significance for the church today. In the book of Acts, the story of Jesus begun in the Gospel of Luke broadens into the story of the Holy Spirit, guiding the fledgling church to proclaim the saving reality of Jesus. While attentive to Luke's roles as a literary artist and theologian, I. Howard Marshall focuses primarily on Luke's role as a historian. He provides the reader with an accurate, balanced and holistic picture of the church's monumental first years as it sought to fulfil Christ's mandate to preach the gospel to the ends of the earth. This classic commentary has been completely retypeset and presented in a fresh, vibrant new large paperback format, with new global branding. Paul's epistle to the Romans changed the lives of many great Christian thinkers, including Augustine, Martin Luther, John Wesley and Karl Barth. However, while Romans has been among the most influential books of the New Testament, it has also been the subject of some of the church's most heated debates. What is justification by faith? What is the relationship between law and grace? What is God's ultimate purpose for Israel? Without losing sight of the simplicity of the gospel, F. F. Bruce guides us along the difficult but rewarding paths of this great letter. This classic commentary has been completely retypeset and presented in a fresh, vibrant new large paperback format, with new global branding. Jenny Hawke, an artist herself, suggested to her father over a number of years that he write a book about art. After his death his daughters found a box full of scraps of paper on which he had jotted thoughts in preparation for a book such as this. Making a Mark’ is therefore truly the realisation of Eddie Askew’s own vision for a book. A quick flick through brings a smile to the face as you recognise the familiar style of Eddie’s watercolours, then as you settle down for a closer look you enter into his thoughts and prayers and make them your own. Jenny Hawke has written her own commentary alongside her father’s thoughts, prayers and paintings making this a truly inspirational farewell to a much loved man. This is a book like the others before it, to keep by you and look at again and again. For Francis Andersen, the Old Testament book about Job is one of the supreme offerings of the human mind to the living God, and one of the best gifts of God to humanity. 'The task of understanding it is as rewarding as it is strenuous ... One is constantly amazed at its audacious theology and at the magnitude of its intellectual achievement. Job is a prodigious book in the vast range of its ideas, in its broad coverage of human experience, in the intensity of its passion, in the immensity of its concept of God, and not least in its superb literary craftsmanship ... From one man's agony it reaches out to the mystery of God, beyond words and explanations.' This classic commentary has been completely retypeset and presented in a fresh, vibrant new large paperback format, with new global branding. Marshall, Morgan & Scott, 1980. Book. Very Good. hardback. hardback, large thick 8vo, the Broad oak edition, brown covers lettered gilt, bookplate of a previous owner on front free endpaper o/w a very good tightly bound copy, text clean and unmarked, dust wrapper rubbed to edges and faded to spine, 1204 + 784pp. Zondervan Publishing, 1971. Hardcover. Acceptable. 1971. Tenth American Printing. 1986 pages. No dust jacket. Brown cloth boards with gilt lettering to spine. Firm binding to lightly tanned pages with bright copy throughout. Infrequent cracked hinges exposing binding. Light foxing to endpapers and page edges. Occasional light finger marks and small stains to pages. Minor creasing to corners. Moderate shelf wear and markings to slightly bowed boards with tanning to spine and board edges. Several stains and moderate bleach spotting. Moderate rub wear to edges with fraying to bumped corners exposing boards beneath. Minor fraying and tears to spine ends.